The Kenyan Leopard: Where Can You Find Him? Found in regions all across Kenya, the leopard is the smallest of the big cats. Even so, they are still one of the major predators of the savannah grasslands. A male can weigh approximately 100 lbs, which is substantially smaller than a lion. 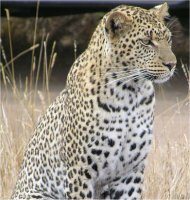 With their spotted coats, the Kenyan leopard is easily mistaken for a jaguar. Leopards are smaller and not as muscular as the jaguar. Also, a leopard's circular spots or "rosettes" do not have dots in their centers, which is a jaguar's marking. Of course, the two would never be confused in the wild because their territories are widely distant. Leopards are found in sub-Saharan Africa, whereas the Jaguar lives in the Americas. Hunting has taken its toll on the world-wide leopard population. Their territory used to spread all across Africa and Asia. Today, leopards are only found in the southern half of Africa, and in a few scattered groups in parts of Asia, such as in Pakistan, China and Malaysia. Their numbers are not as diminished as the other big cats, and it's status is "near threatened" according to the International Union for the Conservation of Nature. This puts Kenya's leopards at a fairly low risk for extinction. Unlike the lion, leopards do not live in groups. These solitary cats will live and hunt on their own, typically at night. The share much of the same territory as the much larger lion, so they hunt at night to avoid competition. A leopard will hunt and eat basically anything they can kill, from small rodents up to full-grown antelope. The leopard isn't confined to any one part of Kenya, and can be found in many wildlife parks or reserves. The Masai Mara National Reserve and the Samburu National Reserve are two parks particularly known for their leopards. A leopard will usually drag its kill into a tree to defend against bold scavengers like the hyena. 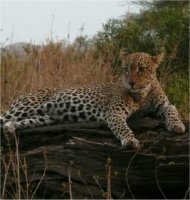 This habit can make the leopard easier to spot and photograph, because its much more noticeable above the tall grasses. An ideal situation for the safari photographer. The number of Kenyan leopards also increases dramatically during the annual wildebeest migration between July and September. With more than a million wildebeest on the move, there are also huge numbers of leopards, lions and cheetahs in pursuit. A variation of the standard spotted leopard is a "melanistic" leopard, which means they have coats that are all black. Without their distinctive markings, these cats are not always recognized as leopards. They are commonly referred to as black panthers. To add to the confusion, black jaguars also exist, and they too are called black panthers. Black leopards are almost never seen in the grasslands, but only in the heavily forested parts of Kenya. In fact, nearly all of the leopards living in the Malaysian rainforest are the black variety. In Kenya, black leopards are quite rare. Which Wildlife In Kenya Is Endangered?